Thousands are expected to travel to and from provinces for the Holy Week. Travel within Philippines is expected to generate higher traffic levels, especially in airports, highways, churches, beaches and other attractions. Expect crowds in known destinations especially places frequented by local travellers as well as foreign tourists. Local Government Units will mobilize Medical/Rescue Teams, deploy security forces; augment Traffic Enforcers, and man Tourism Information Centers. Moreover, Bureau of Fire Protection personnel will also be deployed in strategic areas along the National Highways to assist travellers and provide medical emergencies in case of accidents. 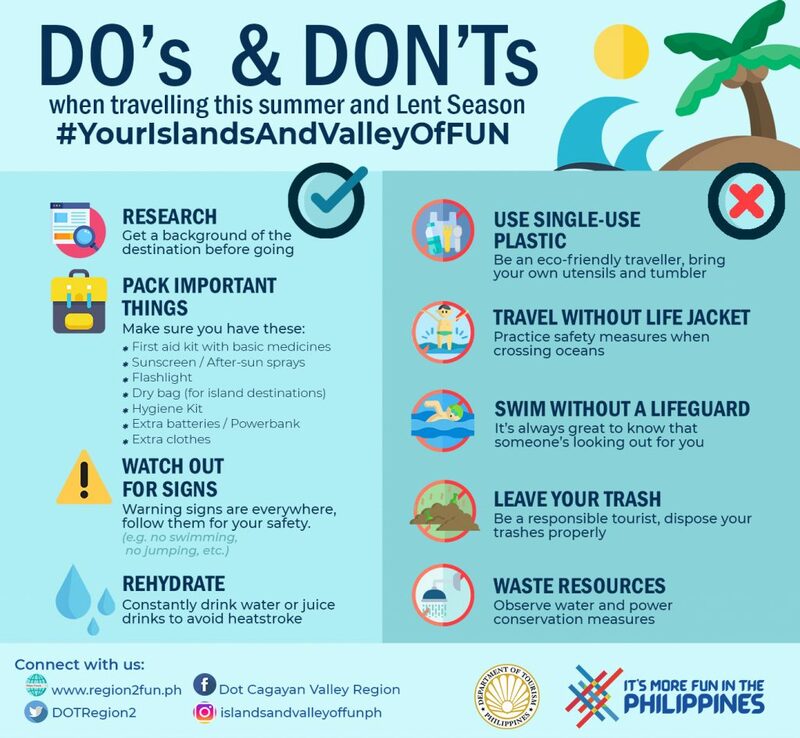 We recommend to travel to less visited and known destinations to avoid traffic jams and crowded areas to have a convenient, enjoyable and memorable Lent Season. Everyone is enjoined to monitor instructions and advisories of local government units and reputable media organizations on present situations in areas frequented by tourists. DOT Cagayan Valley and Northern Philippine Islands: “The Islands and Valley of Fun”.